One of the unique systems we offer is a our Hand Applied CLEAR COATING SYSTEM, that fills scratches, swirls, and fading on automotive exteriors. This revolutionary system is called GlowPro, and is exclusive to OnSite Restorations. GlowPro literally makes your used vehicle look freshly painted and revitalizes the colour! No need for old-fashioned wet sanding! This hand applied clear coating system actually adds a new layer of clear. It can be done on location without spraying! Want To Use GLOWPRO For Your Business? We are now making our permanent, self-leveling, non-spray clear coat available to existing automotive businesses outside of Canada, as an add-on service that you can offer. With training and experience, it takes about 2hours/vehicle, bringing the original paint back to life. 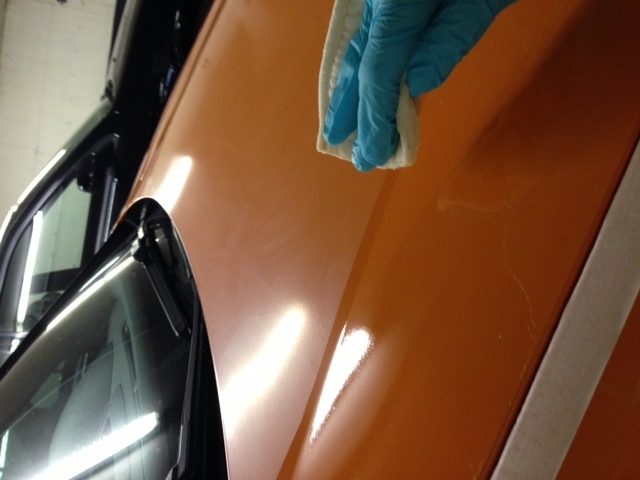 It’s not a “magic” polish that will wear away…it’s legitimate clear coating that bonds to the factory clear. If you are Detail Shop, Mobile Company or Car Dealership in the US or outside of North America, adding this system to your reconditioning services is a great source of additional revenue. We offer training at our Toronto location or through instructional tutorials and videos.